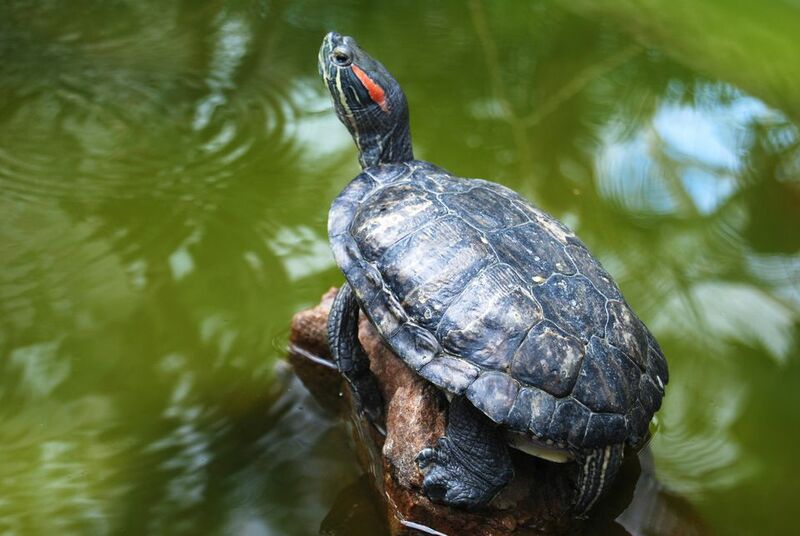 Red-eared sliders need a diet that is a mixture of both animal and plant materials. Young red-eared sliders eat more animal protein, so babies should start with a diet that's more on the carnivorous side. It's still a good idea to offer vegetation to young turtles, even though they may not start eating it until they get a little older. Offering it early on could make it less likely that you slider will shy away from trying vegetation as it ages. That is useful because vegetation should make up a significant portion of the adult red-eared slider's diet. Commercial pellets are fairly nutritious, convenient, and beneficial since they contain a good mix of vitamins and minerals. However, as the saying goes, variety is the spice of life. Offering a wide variety of foods is better than just dropping in a commercial turtle pellet for your little guy. A variety of fresh food offers a wider range of nutrients in different forms, which may even be absorbed better when fed in the natural state. Prey Items: Earthworms, crickets, waxworms, silkworms, aquatic snails, bloodworms, daphnia, shrimp, krill, and mealworms. For very small turtles, prey may have to be cut into smaller pieces. Larger turtles can be offered larger prey, such as tadpoles or feeder fish, though some experts warn that feeder fish may carry parasites and other undesirables, and some fish (like goldfish) are too fatty to be fed regularly. Leafy Greens: Collard greens, mustard greens, dandelion greens, kale, and bok choy. Iceberg lettuce should never be fed because it is not nutritious enough, and dark green leafy lettuces such as romaine can be fed sparingly. Make sure you feed items with appropriate calcium-to-phosphorous levels. Aquatic Plants: In an aquarium or pond, you can add aquatic plants that turtles usually love to snack on. They often eat submerged plants like anacharis, water hyacinth, water lettuce, duckweed, azolla (fairy moss), and frog-bit. Other Vegetables: Carrots (both the orange vegetable and the green top), squash, and green beans. Vegetables can be shredded to make them easier to eat, which is especially helpful with smaller turtles. A good reptile multivitamin with calcium and vitamin D3 should be mixed with the turtle's food a couple of times a week. Also, an excellent way to provide additional calcium is to put a cuttlebone in the turtle tank. These are often available in the bird section of your local pet store and can be affixed to the tank with suction cup clips or just floated in the water. Catching wild prey can be dangerous if they have pesticides on them and they can carry intestinal parasites. The same goes for vegetation like dandelion greens that you pick outdoors. Some experts recommend fresh fruits such as bananas, berries, apples, and melon. However, this isn't a natural staple in the red-eared sliders diet, and it may cause diarrhea. If you offer any fruit at all, limit it to very small quantities as a special treat. Don't feed frozen fish, or at least not very often. Freezing some types of fish increases levels of an enzyme in the fish that destroys vitamin B1. Cooked chicken and lean beef don't offer balanced nutrition and will foul the water very quickly. Use these only as very occasional treats in a feeding tank. The protein contents can also contribute to kidney disease in your turtle. Never feed raw chicken or meat due to the risk of bacterial contamination to both you and your captive turtle.